Get stylish wisdom and advice from cards featuring fashionistas whose words will tailor your ‘tude. "Loyalty is the most important label to wear," says Anna Wintour. "If you fall off your platform, throw your head back and smile," is Naomi Campbell's hard-won advice. In the fashion world, conventional thinking is so last year. Whether you're struggling to find your style, or want to break out of the box, you'll find a fashion-forward take when you pluck one of these oracles from the deck. Each charmingly illustrated card contains three pieces of insight, wisdom, and advice inspired by the fashion great featured on it. With guidance for work, life, or inspiration, any obstacle becomes surmountable. Never forget Irving Penn's wise words, "Style is how you hold yourself, not who you wear." 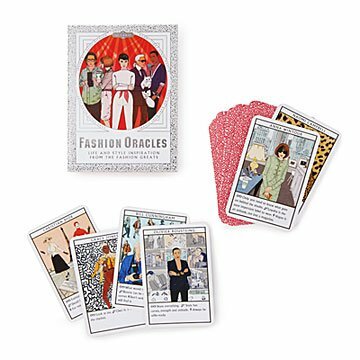 Deck comes with a booklet featuring fascinating fashionista bios and details of how to use the cards. Made in China.